Jeff and I just came home from my amazing 60th birthday trip to National Parks I had not yet visited. I’ll be posting pictures and memories later but before I start describing the amazing time we had I have to comment on one thing: Some tourists are horrible humans and dumb asses. In our travels we saw more bison than I could take pictures of and yes, there were quite a few, cute baby bison. Much to our horror the bison-in-the-van incident happened just days after we were introduced to the beautiful beasts. We were stunned that anyone would be so stupid and thoughtless. You can barely walk through a visitor center or read a pamphlet without seeing very clear warnings and instructions about co-existing with wildlife. Also, just a day after we were enjoying all of the geysers and pools at Yellowstone, this little gem appeared in the media. Evidently, a group of “tourist bros” decided to just tromp around on the Grand Prismatic Spring in Yellowstone. I’m very glad Jeff and I visited before all the madness of the tourist season which, evidently, begins on memorial day weekend. 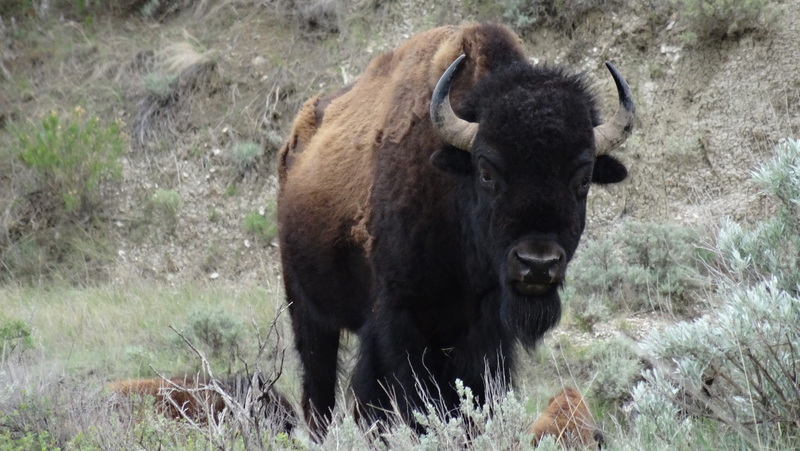 If you are traveling to national parks this summer may I suggest getting out in nature early in the morning (most of the visitor centers open at 8am but the parks themselves are open much earlier). Drive carefully, obey the rules of safely observing wildlife, and take all the pictures you can handle. I’m starting my next 30 years on the 8th of May. To celebrate, Jeff and I are taking a driving trip to some National Parks I have never visited. We leave in a couple of days and though I have planned the whole route and where we are staying along the way, I wonder about points of interest that exist on our route that would make this even more fun? Here’s my route. Please feel free to comment with some of your favorites. We are starting in Portland and going directly to Kalispell for just one night. Here is our route. I doubt we will be stopping much along the way except for a meal and a few breaks. The next day will be driving to East Glacier. Ideally, I would like to have taken Going-to-the-sun-road from Kalispell all the way to St Mary. However, according to the Glacier National Park road status site the road is closed at Avalanche Creek coming form the south, and closed at Jackson Glacier Outlook coming from St Mary on the east side. I suspect we will go from Kalispell to Avalanche Creek, then turn around and follow this may up to St Mary and all the way to Jackson Glacier Outlook. Our first day will be mostly driving and taking pictures. The next two days we will do some hikes and try to not get eaten by bears. If you have recommendations for easy hikes I’m interested. After two+ days in Glacier we are meandering to Billings, about a third of the way to Theodore Roosevelt National Park, for a quick overnight. From there we will continue to meander to Dickinson, ND with easy access to Roosevelt where we will hang out for a couple of days. Again, any sights along the way or at Roosevelt would be greatly appreciated. You will have to zoom in a little on this map to see these three locations (click on More options to open a bigger map). Jeff knew I was thinking about this trip at Christmas so I was happy to find this great book by National Geographic about the National Parks under the tree on Christmas morning. Reading about the Badlands and Wind Caves was inspirational. Mt Rushmore–I just want to see that for myself. The last three full days will be spent in and around Yellowstone. We will be staying at an Airbnb on the East side of Yellowstone. Based on what I’ve read and heard Yellowstone should keep us very busy for those three days. While we are there we will also do a day trip to Grand Tetons National Park. We will head back to Portland, stoping for a night in Boise, ID just to break up the long drive. Clearly we are driving a LOT. But I figure now is a good time for this great American driving trip. Gas is on the lower side and it’s the 100th anniversary of the National Parks. We will be hiking, eating, mixing with the locals, going to every odd and interesting thing we discover, and taking a HUGE number of pictures, which I will post here as we go. 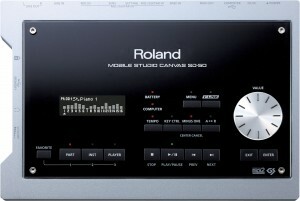 I got a new Roland SD-50 Mobile Studio Canvas sound module this week. As a first step in updating the internal software I went to the device to format a USB stick and got a message “USB not ready”. Seemed that every stick in the house elicited the same response. After an exchange with Roland Support (who was very nice and confirmed that it “should work”) I thought I would try something obvious. I formatted the USB stick in my computer with a FAT32 format first, then plugged it into the SD-50 and it worked. For some reason this little trick was not in any post I read online so I thought I would share. Just went to update my iPhone to version IOS v7 connected to a Windows 7 machine. Received the error “You do not have permission to access the requested resource”. Checked all my versions and updates—there’s nothing wrong. NOTE: Make sure iTunes is updated and your OS is updated. This is a given. Restart your machine then try again. This solution worked on Windows 7 x64 with iPhone 4S. Configure or turn off the firewall. DONE! Login from an RDP client. This may be my favorite cookie recipe of all time. 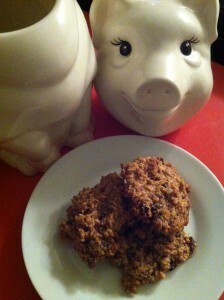 If you really love oatmeal you will love these. Be prepared to eat too many in a single day. Click here to download the PDF version. Cream butter and raw sugar together in a large mixing bowl. Add eggs and honey and mix to incorporate. Sift into this mixture flour, salt and cinnamon then mix again to incorporate. Add all at once oats, pecans and raisins then mix until completely combined. The dough will be very stiff and rather sticky. Form into 1 – 1 1/2 inch balls and position on a parchment covered cookie sheet. This is important: These cookies will not melt and form a cookie shape–you have to shape them yourself. I like my cookies to have uneven edges because they get really crunchy. Let cool completely before eating. If you store these in a cookie jar (recommended) use the crumbs at the bottom of the jar for a little crunch on some ice cream. Jeff and I had dinner last night at Ate-oh-ate on Burnside. I am from Oahu and, as far as I’m concerned, an expert with regard to plate lunches. This was not impressive. Let’s start with the food, since it is the essence of a restaurant. They purport to be a “Hawaiian-Style” establishment, so I can’t skewer them too severely. They are not claiming to be authentic. In fact, “authentic” might be a bad word to use with regard to plate lunch because, after all, a plate lunch is really a mash-up of many cultural flavors. However, much of the food is not…authentic. In a way it is too good to be authentic. The mac salad has too much going on. That is the opposite of a good Japanese-Hawaiian style mac salad. Mayo, a little shredded carrot and the essence of a Japanese tabi, as my grandfather used to say. That kind of mac salad is the holy grail of plate lunch. This salad was ok, although a little under seasoned, but it had something else in it that was wrong. Maybe it was a little tuna or some finely chopped cabbage, not sure, but for the first time in perhaps my entire life I left some salad on the plate. One of my friends just gasped. I ordered “Japanese style” curry. First, it was not Japanese style–it was Thai style, with too much coconut and a distinct flavor of lemon grass. Second, they did not understand my request to put the curry, rice and mac salad all on the same plate. Once I got the food it made sense. The curry was more soupy than Japanese style curry so it really could not be on a plate but had to be in a bowl. That meant I could not have the quintessential plate lunch experience of the curry and the rice and the salad all touching each other and–can I say out loud–mingling on the same plate. On a positive note, the chicken katsu was excellent. Jeff had fried saimin, which is yakisoba by another name. This is not an uncommon dish but, in my opinion, they messed it up with upscale ingredients. Jeff is not fond of pork belly (I know, crazy but stay with me). It’s too fatty for his taste. Frankly, I didn’t like it either in this dish. Usually it is Chinese bbq pork, which is leaner than pork belly, and is cut into thin slices. The distinct, sweet flavor of Chinese bbq pork lends itself better to this preparation. Pork belly, though delicious, seems out of place to me, as it vies for attention in the mix instead of playing along, like a good plate lunch food should. Perhaps most importantly the place was cold and without aloha. I know, “aloha” is a difficult quality to define but when it is missing a local person knows it. High ceilings, minimal decoration and the constant drone of “Jawaiian” music did not make for a good atmosphere. Now, I know that Jawaiian is a legit category of Hawaiian music but I contend it is crap and just the over-influence of hippies high on ganga. Sorry, my opinion. When I go into a Hawaiian establishment I expect to hear the greats of Hawaiian music like Gabby Pahinui, Genoa Keawe, Cazimero Brothers, Iz and so on. 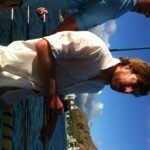 My advice: Stop trying to be what you think mainlanders think Hawaii is all about and go back to roots. Make the food the way it is remembered and loved, play a variety of Hawaiian music in addition to a little Jawaiian, bring in some people with some aloha and warm up the decor. You may find that this appeals to everyone. I might stop in again in the Summer, when a cold restaurant feels good but, at the moment, I can make my own katsu and Japanese curry and mac salad. Ok, the mac salad is a work in progress but I have connections in the meantime. In the 80’s my friend Pat and I used to have lunch at a restaurant in the Portland NW Industrial area called Junie’s. My understanding is that many years previous it was on Broadway, downtown. Anyway, they had two items on the menu that I adored: the Hungarian mushroom soup and the lemon chiffon pie. Each time I had that pie I asked the server what I would have to do to get that recipe and she politely said “sorry, not a chance”. It was their own take on the RIO lemon chiffon pie, for which there are many variations. One day I went for lunch and asked again and the server said they were closing after many years and she photocopied the recipe from their book and gave it to me. I have made this recipe many times over the years and it is always creamy and delicious, just as I remember it at Junie’s. 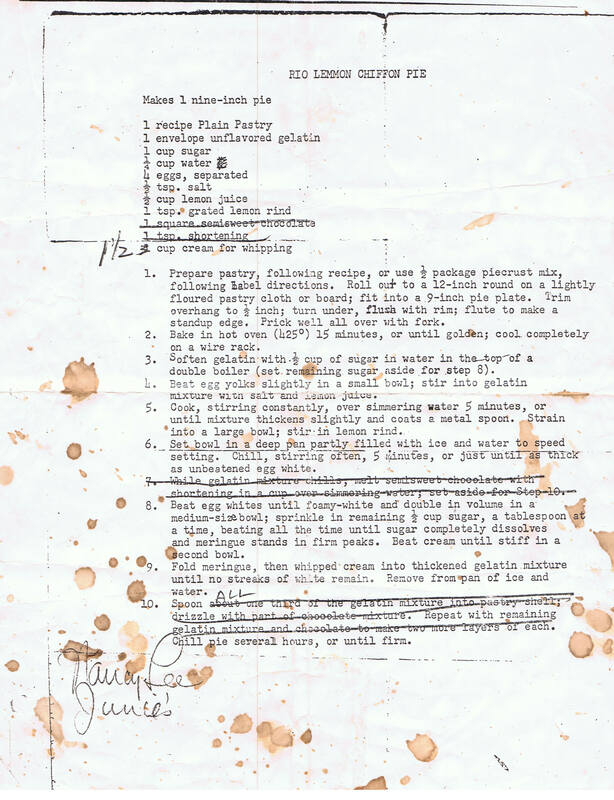 Here’s an easy to follow revision of Junie’s original recipe. Also, there is a variation of my own–guava Chiffon (a nod to my home state). Enjoy! Oh, and here’s a PDF version. 1. Make your favorite pie crust, blind-bake it and set it aside to completely cool. 2. In the upper vessel of a double-boiler, NOT over heat, soften 1 envelope of unflavored gelatin and ½ cup granulated sugar in ¼ cup water. This should take about 5 minutes. 3. In a separate bowl slightly beat 4 egg yolks. 4. Whisk the egg yolks, ½ teaspoon salt and ½ cup freshly squeezed lemon juice into the gelatin mixture and cook in the double boiler for about 5 minutes, stirring the whole time. The mixture is finished when it coats a metal spoon. 5. Put the upper vessel of the double boiler into an ice bath and stir in the lemon rind. 6. Chill, stirring often, until it is thick as a raw egg white. 7. Whip the 4 egg whites with ½ cup sugar until stiff peaks are formed. Set aside. 8. Whip 1 ½ cups heavy cream until stiff. 9. Fold the whipped egg whites into the lemon mixture then fold in the whipped cream. 10. Pour into the cool pie crust and refrigerate. This pie is at its best after being refrigerated for at least 4 hours. 2. In the upper vessel of a double-boiler, NOT over heat, soften 1 envelope of unflavored gelatin and 3 tablespoons granulated sugar in ¼ cup water. This should take about 5 minutes. 4. Whisk the egg yolks, ½ teaspoon salt into the gelatin mixture and cook in the double boiler for about 5 minutes, stirring the whole time. The mixture is finished when it coats a metal spoon. 5. Put the upper vessel of the double boiler into an ice bath and stir in the guava juice concentrate. Optional: This pie is a light salmon color, which might freak some people out. You can add a couple of drops of red food dye at step 5 if you really need to. Personally, I’m ok with the color. Form into about 1” balls and place on cookie sheet about 2 inches apart. Using a flour-dusted fork, press down slightly in two moves so as to create a hash mark on top of each cookie. Bake at 375° for 15 minutes. Cool for 5 minutes then move to paper towels. Let cool completely before eating.